Get a Social Security 1099 form (SSA-1099). For over 80 years, Social Security has worked to meet the changing needs of the American public. Today, you can apply for retirement, disability, and Medicare benefits online, as well as take care of other business. Knowledge is power. You care about your friends’ and family’s future, so encourage them to create a my Social Security account. Celebrate National Social Security Month by learning what you can do online anytime, anywhere. This entry was posted in National Social Security Month, Online Services by Darlynda Bogle, Acting Assistant Deputy Commissioner. Bookmark the permalink. Unfortunately all these benefits and convenience associated with establishing an account, do not apply to me. The reason is the stipulation of having a US address. Living outside the US I am still able to have a Medicare account. There is no problem with that, security and privacy are not compromised at all. When will Social Security remove the need for a US address, before one can benefit from an account?? What is the answer to Fahmi Nature’s question? No reply so far!!! Someone needs to look into this technicality that prevents so many Americans, living overseas from benefitting from a personal account. Last time I heard the number around 60,000 Americans receiving social security and living outside the US. Is it fair that non of them can benefit from a personal account. We need help. REQUEST , Hi , Miss Bogle I would like to know am l old enough to have Medicaid dob 04.07.1956 and I need a social security card ,THANKS….. I want to change where my SS checks are deposited. How do I get the information to change it? I do have the paper to change to the credit union I want the funds to go. Can I take a picture and email it to the government or do you need a hard copy sent in the mail? Hi Bonnie. Thanks for the question. 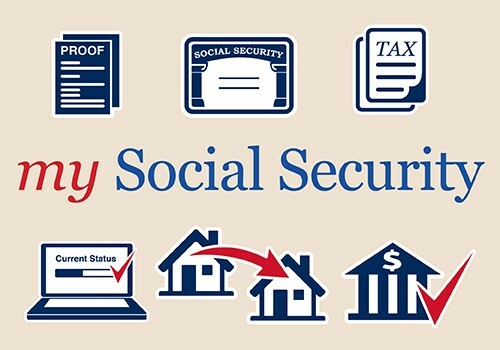 If you’re receiving Social Security benefits (retirement, survivors, or disability), you can start or update your direct deposit information by using your personal my Social Security account. 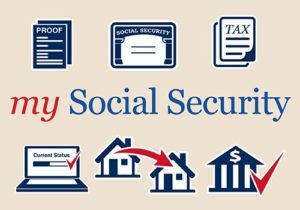 If receiving Supplemental Security Income (SSI) or unable to conduct business online, you can start or update your direct deposit by contacting the bank, credit union, or savings and loan association or by calling Social Security at 1-800-772-1213 (TTY 1-800-325-0778). See our Frequently Asked Questions web page for more information. Yes, I’ve been trying for 2 years to get answers and I can’t they just Shaun me off!!! I was 54 in August of 2017 I had been drawing my dissabilty since 2007. I had been married for close to 25 years. Then my husband had been drawing since I guess 2009 he had his full dissabilty!!! However, that is what we lived on!! Both he and I (our social security dissabilty together) But when he died on August 6,2017 I went to our local social security office by the way he had drawer for years on other health problems BUT!!!!! In Feburary 14, 2014 he had a massive massive stroke it left him completely PARALYZED on his left side after his stroke and we hoped he could use his right side but NO NO NO about 2 years or so before his stroke he had a completely HIP REPLACEMENT TOTALLY and he begin getting much sicker come to find out his SURGERY went bad he was septic in his hip and at UAB IN BIRMINGHAM, ALABAMA they took it completely out and said they couldn’t put another in due to his condition!! Not make it thru surgery!! However he was drawing 1,372.00 monthly I was drawing 1,036.00 monthly when he died they said I could only draw mine and 240.00 of his check?? IT DOESNT SEEM RIGHT I HAVE NO IDEA BUT OUR BILLS WERE BASED ON TH AT being we had been married that long and together and loved together many years before our marriage is that AMOUNT RIGHT??? WHY I HAVE THE QUESTION IS THAT I WAS ALREADY DRAWING MY DISSABILITY BEFORE THAT HE DIED ACCORDING TO SOME PAMPLETS I WAS SUPPOSE TO DRAW 71% TO 99 % IF I WAS ALREADY ON DISSABILITY!!! PLEASE PLEASE CHECK INTO THIS NOONE WILL AND ITS VERY IMPORTANT TO ME I NEED TO KNOW THE RIGHT ANSWER PLEASE IVE PRAYED ABOUT THIS BECAUSE IM LOOSING OUR HOME AND EVERYTHING WE HAD. ELIZABETH MILLER DOB 8-8-62 SSN *** – ** – *** MY HUSBAND ROGER MILLER DOB5-28-55 SSN *** – ** – *** THANK YOU!! I am having no luck setting up my account. Can someone help me? Please allow us overseas Social Security Retiree’s to create an ONLINE ACCOUNT. Calling back to the SSA tel # a person is waiting online for 45 min, 1 hour or more with intl phone charges, cuts and hang ups. It’s next to impossible to get help. Then the SSA office in Costa Rica, forget it, they wont answer. So, you see, allowing us overseas to create an ONLINE ACCOUNT would help immensely. Please answer. I have a whole year of earnings missing from my earnings record I submitted a request for my income tax transcripts (that was over a month ago still no reply) I had the same employer before, during and after the missing year of earnings. I have been retired since 2007. I already have an account, but I have not been able to log in from my I-Pad for two weeks now. All I get is a white page. I have to use my computer to log in. Will this problem be fix soon ? I am currently on disability. But due to incorrect information my payments went down. I am still waiting to hear back from Social Security. How long does it take for a correction? My Social Security card is WORN OUT. How do I get a new card? I hope ssa history month is my history month too for my dream come true on my 65 years birthday.and 33 years in this country 30 years been suffering with depression/diabetes/high hypertension. My Social Security and Social Security Disability coverage is the same number I have repeatedly informed you about. While Social Security workers routinely continue to provide the ongoing female & Spanish or Columbian thief and illegal representative who Social Security now fabricates to have given all my benefits and finances since 1966 up until now. I think this news was about to create a saving card Account. But still thankyou for this SS Aniversary. I live abroad and have a MySocial Security account. Every year, SSA in the USA sends beneficiaries who live abroad Form SSA 7162 which needs to be filled out and returned for benefits to continue. This form is sent by conventional mail and not electronically. Mail service in my location is unreliable at best and for the last three years, I have not received this form. As a result, my benefits were cut off without notice each February. I then need to download the form, send it to the FBU in Manila and they will eventually get my benefits restored. Each time, there has been no notice through My Social Security account that the form has not been received and/or that my benefits will be cut off. I know three other people in my area who have this same issue. Why cannot My Social Security be used to notify that benefits are about to be cut off so steps can be taken before the actual cut off? Imagine getting your salary cut off without notice? Sending notices that need to be returned by conventional mail is ludicrous in 2019, especially to countries with poor mail service. Please consider using My Social Security accounts to address this problem. so can any one clear this up? i sent form in saying they were wrong but still no answer. which is causing me a lot of stress. I am trying to apply for medicare online. My mother lives with me and has an account. She has my same address, phone number and email. Every time I try to create an account for me, the online system says I already have an account and logs me into hers. How do I get around this? I have been unable to create my account. Do I need to.go to an.in person office for.help? I am now a widow. My husband was a veteran who just died three months ago. I want to know since I have no income due to him being the main income earner and I recently losing my job, is there any positions that I can work from home as I have many skills, including customer service, administration and great word processing along with typing skills? I also want to know if there is a way that I can get SNAP, Medical benefits and/or my husband’s benefits? I am not age 60 yet, I am not sure if I have a condition that is permanent right now as I will be getting a medical exam next month to see if Morgellon’s is a disease that qualifies as a disability or Migraine Headaches qualifies as a disability? Please help me as I want to work, but can’t seem to find work. If there is any way that I can get my husband’s SS benefits at this time? I will be 60 in 2021. I look forward to your response. I lost my SS card and would like a replacement card. Hi, Amjad. First, realize that you may not need a replacement card. You will rarely need to show it. Knowing the Social Security number is what is important. To see if you’re eligible to apply for a replacement Social Security card online or to learn more on the process and what documents you will need to get a card please visit our Social Security Number and Card page. Keep in mind all submitted documents must be either originals or copies certified by the issuing agency and must (unless otherwise indicated) have been issued within the last two years. We cannot accept photocopies or notarized copies of documents. Once you’ve submitted all the needed documents, it can take up to 10 business days from the date we received the application to mail a replacement card. We hope this helps. I’m going to receive my first social security check this month. I took it at age 62 out of necessity, but now I’ll have financial help for maybe one to two years. I’ve read about suspending the social security account and in the future you can then claim your social security check again. If my ss check is $800/mo and I decide to suspend this and apply for ss again when I’m 64, will it still be $800/mo, or will the new ss claim be as if I never claimed ss before and it will be at the higher amount? Thanks! Hi, TM. If you file for Social Security benefits and then you change your mind, you may be able to withdraw your Social Security claim and re-apply at a future date. However, if you change your mind 12 months or more after you became entitled to retirement benefits, you cannot withdraw your application. For more information, visit our Benefits Planner: Retirement | If You Change Your Mind web page. If you have additional questions specific to your case, you can call us at 1-800-772-1213, Monday through Friday, between 7:00 a.m. and 7:00 p.m., for assistance. Generally, you will have a shorter wait if you call later in the day. You can also contact your local Social Security office. We hope this helps.